The Bears are Out in Force! AKA "The Teddy Bear's Picnic"
The staff knew nothing of the history of the print nor of the artist. However, with the Internet there are no secrets. 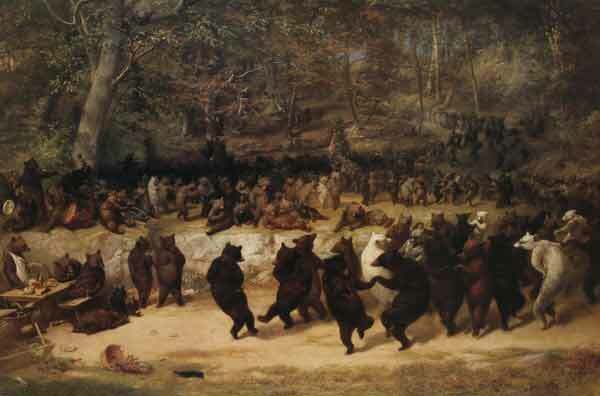 Simply typing "dancing bears" into Google led me to William Holbrook Beard. The correct name of the painting is Wall Street Jubilee, or The Bears of Wall Street Celebrating a Drop in the Stock Market. (In the Fall of 2008, this was very courant) Beard is the artist responsible for The Bulls and Bears in the Market, which may be found (in reproduction) in the cubicle of every stockbroker sentenced to make cold calls. Holbrook Beard was an "almost great" painter. 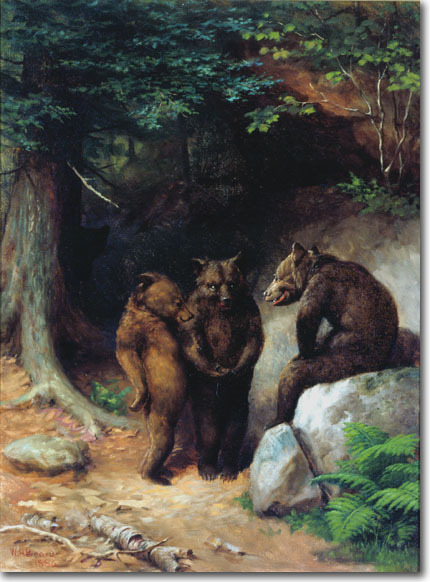 Born in Painesville, Ohio in 1824, William Beard painted anthropomorphic, satiric genre scenes with animals engaged in human activity, and frequently bears were his symbols for human beings. So, You Want to Get Married, Eh? Early in his career, he was basically self-taught although he painted with his older brother, James Henry Beard. From 1856 to 1858, he traveled in Europe, studied painting in Düsseldorf and Rome and met and painted with many American artists including Emanuel Leutze (Washington Crossing the Delaware), Sanford Gifford, Worthington Whittredge, and Albert Bierstadt; the latter three well known as part of the Hudson River School. He returned to America and set up a studio in Buffalo, New York in 1850, remaining there until 1856 when he went to Europe. He returned in 1858, living in Buffalo until 1860 when he settled in NYC at the Tenth Street Studio Building. He was honored with election to the National Academy of Design in 1862. In 1866, he traveled West by train, and in Colorado his companion was Bayard Taylor, a writer and lecturer. He wrote to his wife, the daughter of New York portraitist Thomas le Clear that he thought the landscape was monotonous, was disappointed he didn't see more buffalo, and was unhappy with wild life and hardship living. As a result, he turned more and more to his imagination, retaining an interest in wildlife but not in studying their habits and environment first hand. I have attached his Self Portrait and it appears that he surrounded himself with the artifacts of his travels. 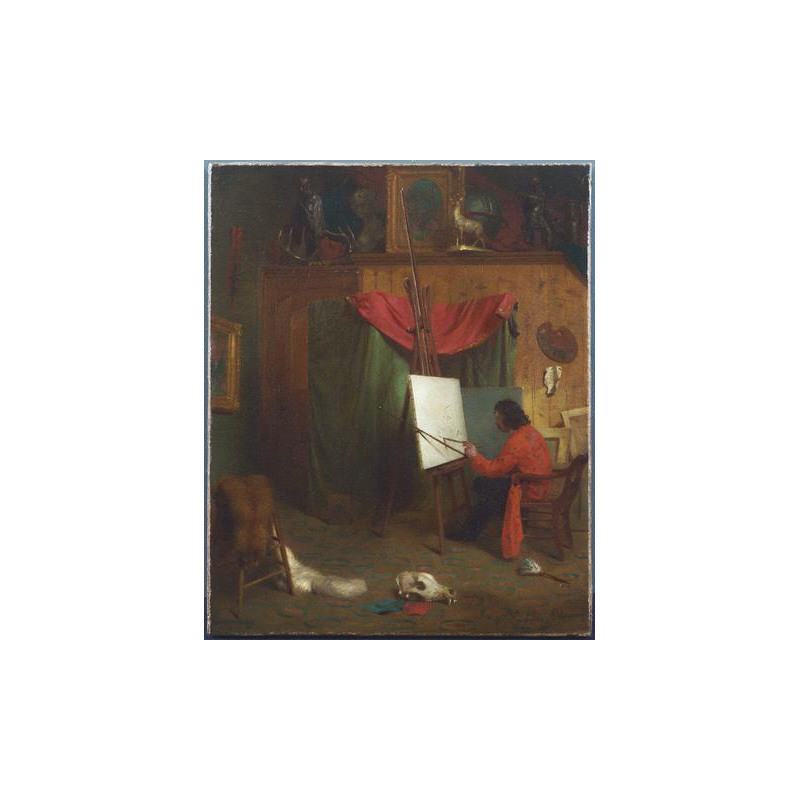 As alluded to in his self-portrait, Beard created genre paintings, architectural studies, and allegorical works, his most popular works were his anthropomorphic paintings, satiric pictures of animals engaged in various human activities, representing animals as realistic physically but atypical in their behavior.. The original oil of both Bulls and Bears and Jubilee are in the collection of the New-York Historical Society. William Beard is generally regarded as a better artist than his brother James Beard, but both were successful during their life times. 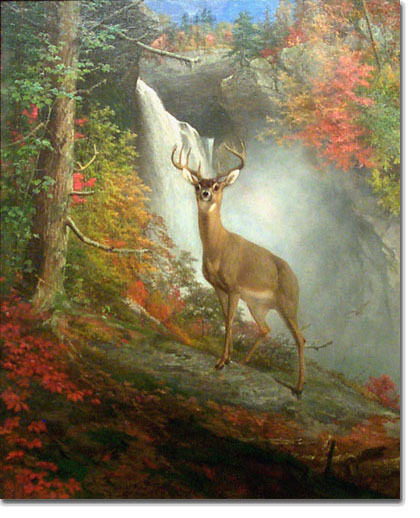 Among the "successes" is the painting Majestic Stag which has been reproduced endlessly in all forms -- prints, tapestries, sculpture, t-shirts, stenciled on vans, etc. This is the quintessence of "nature kitsch". Beard died in New York City in 1900 and was buried in Brooklyn's Green-Wood Cemetery, also the resting place of Boss Tweed, "Butcher " Bill Poole, and Horace Greeley. [Poole was the model for Bill Cutting in the film Gangs of New York.] Beard's success and celebrity had run their course, because he was buried in an unmarked grave. In 2002, a Beard retrospective was held at the Alexander Gallery in New York. Revived interest in his biography revealed that his grave was unmarked. 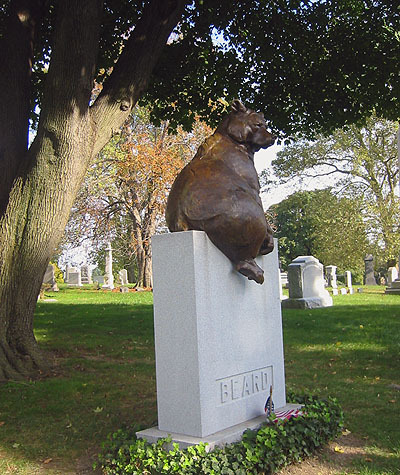 A combination of donations and grants led to the purchase of sculptor Dan Ostermiller's bronze, L'Ours, and its incorporation into a headstone for Beard's grave. The headstone was dedicated in 2003. 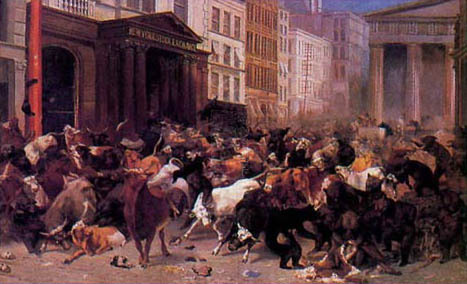 The Wall Street Jubilee painting also had an interesting history. For years, it hung in the "Stranger's Club," an establishment for intellectually advanced but impoverished denizens of the artist's colony. Inexplicably, it became known for its rude and irascible waiters. Upon the dissolution of the club, the painting passed through a series of hands until it was acquired by the New York Historical Society.